Mice come in all shapes and sizes—some are clunky, ergonomic beasts that seem to have a nook and cranny tailor-made for every part of your hand. Others are low and smooth, so slight as to be almost nonexistent. 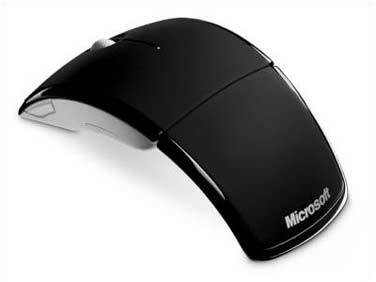 Then there’s the Arc Mouse, so named for its shape when fully extended into its operational position. This mouse is lightweight, with a spare body, and it comes in black or red. It’s just the right size for my smallish hand—but I can imagine that people with smaller or larger hands will also be comfortable using it. It has a matte plastic shell that I found especially agreeable, smooth but not slippery; my hand felt secure around it and holding the mouse took no effort. The Arc Mouse has a classic three-button setup for the left and right buttons, plus a ratchet scroll wheel that also acts as a button. An additional left-side button operates with either your thumb or, for left-handed mousers, the third or fourth fingers. The mouse’s buttons and wheel have a nice, reassuring feel and sound; you don’t need to expend too much effort, and you always get good feedback. The Arc Mouse folds so it's easier to stash in a bag. The placement of the fourth button makes the mouse somewhat more conducive to right-handers than lefties because of the natural inclination to use your thumb for this button, but lefties can still easily reach the fourth button with the third or fourth finger. 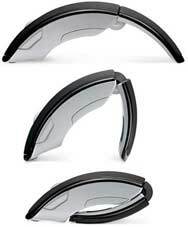 Despite its unique look and fold-up function, the Arc Mouse acts like most other mice. It is very light, however, and while I am quite comfortable using it, I can imagine it may not be the mouse of choice for everyone, at least not for full-time use. You can use OS X’s Keyboard and Mouse preferences with the Arc Mouse to adjust tracking, scrolling, and double-click speed. You can also program the scroll wheel as a button and the fourth side button using the OS X Expose & Spaces preference pane. However, you can also install Microsoft’s IntelliPoint software and use that to program all the mouse’s buttons, which will give you a greater variety of programming options. The mouse obeys software settings nicely, as long as you don’t mix Mac OS X settings with IntelliPoint settings: if you do, programmed button behavior may be unpredictable. The Arc Mouse is compact and neat, and travels easily. It folds nearly in half for travel, almost like a cell phone. The device is sturdy, though, and the folding part attaches on a metal hinge, so there’s nothing flimsy about it, and it snaps smartly into position. The mouse comes with a faux-suede carrying case with small magnetic flaps to keep it closed when you’re traveling. Its two AA batteries (included) shut off automatically when the mouse is in its folded travel position, and a tiny light in between the two top buttons glows green when the batteries are fully powered and red when they are low. Its 2.4GHz receiver is housed in a small slot on the bottom underside of the mouse’s body, and stays put with a slight magnetic force. If you want, you can leave the receiver in the USB slot of your laptop—it’s so small, it won’t get in the way. I found the mouse to be operational from at least 30 feet from the receiver, even through the walls of my home. I am impressed with the Arc Mouse, and am very fond of its look and feel and convenience. It has enough unique features to recommend it. And because it’s so sturdy and stable, you can use it as a desktop mouse, too.